I heard about this cookbook on Ree Drummond's blog "The Pioneer Women." I figured if Ree likes Alice Currah's recipes then they ought to be good!. After I saw Ree's post about Alice's new cookbook I went and looked at her website and printed out several recipes that I thought looked awesome, so I ended up getting the cookbook. I love when cookbook authors write a little story about why they make certain recipes. I think it makes the cookbook seem so warm and personal and I want to make the recipes from it so much more. Savory Sweet Life is a great cookbook in that Alice explains when and why she made each recipe for different holidays and occasions. This recipe was way outside the box for me. I have always been a simple flavors cook, but recently I am trying to branch out and try new things. I have seen so many recipes that call for using curry powder and I always pass them up because in my head, I definitely would not like curry powder. I saw this recipe and I figured that curry powder used in a marinade may be a great way for me to test out the flavor. I found I liked curry powder! This was a very flavorful dish. I especially loved the peanut coconut sauce, which is also something I did not think I would ever make myself. It was nice to have something completely different in our dinner mix. It says that you can marinate the chicken for at least an hour or overnight. I like to marinate as long as possible to get the best flavor, so I marinated it overnight. Mix together all ingredients besides chicken in a medium bowl. Add chicken and stir to coat. Cover bowl with plastic wrap and marinade overnight. Place chicken cubes on skewers. Grill indirectly for 15 minutes or until chicken is no longer pink. Serve with Peanut Coconut Sauce. Combine all ingredients in a medium saucepan and cook on medium for 3 minutes, stirring occasionally. Serve with Thai Marinated Chicken Skewers. Love the recipe and your personal challenge. I'm just cooking through Dorie Greenspan's Around My French Table.. do you have that one? Excellent. 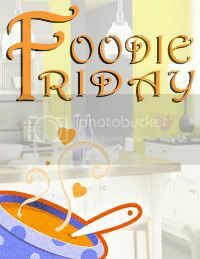 I look forward to seeing what you are cooking each week on Foodie Friday. Surprisingly no I do not have that one! I will have to check that one out. Thanks for the post!